Check your local listings- Geraldo at Large, Geraldo Rivera's new syndicated "news" show, debuts today, effectively killing the revival of A Current Affair. 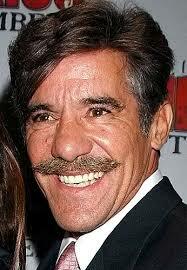 Geraldo describes it as an action-oriented half-hour similar to the weekend program he was doing at Fox News Channel. Which most people never saw... great way to launch a new series. Brad Garrett says his talked-about spin-off of Everybody Loves Raymond is dead in the water. "CBS waited so long [to put it in motion] that we've lost most of the writers," Garrett told a Fox News reporter. And it would have been ideal for CBS to have the show ready for this fall, to lasso some of the big numbers Raymond pulled in for years. Now it just seems like it's an idea who's time has passed. Garrett has now moved on to co-star in the Broadway revival of The Odd Couple with Nathan Lane and Matthew Broderick- as Murray the Cop. Comedian Howie Mandel is headed back to NBC- as a game show host. The show is the American version of international hit Deal or No Deal, described by the network as "a big, exciting game show that contains nail-biting drama and hefty cash prizes." Deal will begin production this week. No airdate has been set. Two networks are looking to shore up their schedules by moving successful shows. But will they kill the golden goose in the process? Fox is weighing a shift of television's number one series, American Idol, from Wednesday (against Lost) to Thursday (against CSI). Why? Thursday is the biggest advertising night of the week, and they can make potentially more cash with a bigger hit than Reunion on that night. Meanwhile, NBC is still mulling a move of My Name Is Earl, also to Thursday, which would be very risky, putting NBC's biggest new hit in the crosshairs. Looks like Comedy Central is happy with Mind of Mencia and its star Carlos Mencia, the network's unintentional replacement for Dave Chappelle. The network is signing the comedian to a big-time multi-platforrm deal. It includes a renewal of his hit series, a one-hour stand-up special for the cable network, and gig hosting a 30-date "Comedy Central live" comedy tour. Also forthcoming: an uncensored DVD of season one of Mind. The show's second season will debut in March.